REGISTRATION CANCELLATION POLICY: By registering for this conference, delegate agrees to abide by the following restrictions and limitations. This policy applies to FULL CONFERENCE REGISTRATION, all other registration types are never refundable. Before 1/11/19 your FULL CONFERENCE REGISTRATION may be refunded to the original purchaser less $150 administrative fee -or- applied to a FULL CONFERENCE REGISTRATION for the subsequent year’s event with $150 administrative fee -or- transferred to another person for use at current year’s event with no penalty attached. 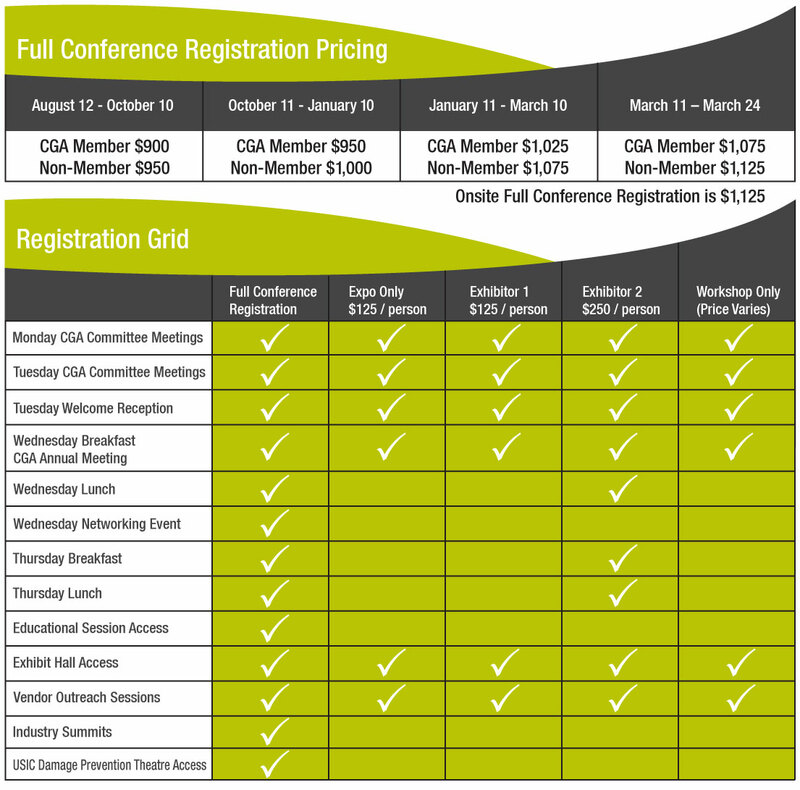 Between 1/11/19 - 3/10/19 your FULL CONFERENCE REGISTRATION may be applied to a FULL CONFERENCE REGISTRATION for the subsequent year’s event with $150 administrative fee -or- transferred to another person for use at current year’s event with no penalty attached. Between 3/11/19 – 3/25/19 your FULL CONFERENCE REGISTRATION may be applied to a FULL CONFERENCE REGISTRATION for the subsequent year’s event with $350 administrative fee -or- transferred to another person for use at current year’s event with no penalty attached. After 3/25/2019 (event begins) your FULL CONFERENCE REGISTRATION is not transferable or refundable. Force Majeure cancellations not attributed to Infrastructure Resources, LLC are not refundable. MEALS: Meals are included with FULL CONFERENCE and EXHIBITOR/2 registration types. $450 of the registration price covers the cost of meals. Meals included are the Tuesday evening welcome reception; refreshment breaks, breakfast and lunch on Wednesday and Thursday; and the Wednesday Evening Networking Event. PHOTO / VIDEO DISCLAIMER: Photographs and video are taken at the CGA 811 Excavation Safety Conference & Expo. By registering for, and participating in, this event, you agree to allow the CGA and Event Producers to use your image in related publications, promotions or websites.